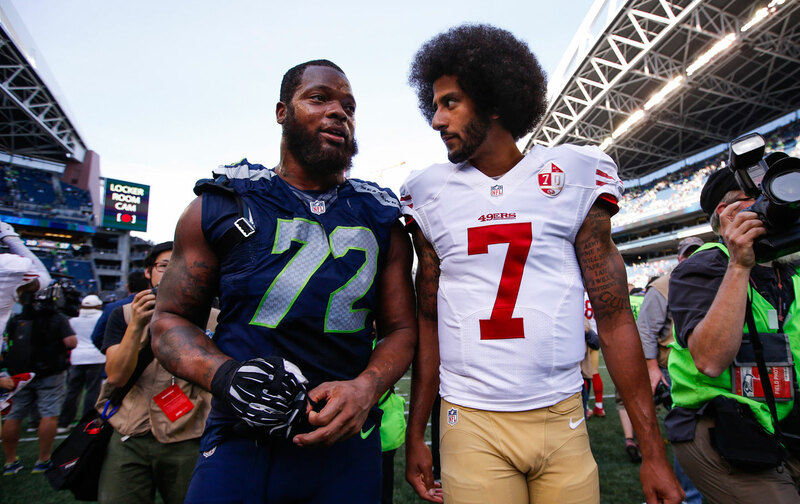 At a sold-out Town Hall Seattle, Seahawks rebel athlete Michael Bennett speaks about Colin Kaepernick, the political Seahawks locker room, and raising daughters. During the Seattle Seahawks’ 36-20 playoff loss to the Atlanta Falcon, Seahawks defensive end Michael Bennett sacked Falcon quarterback Matt Ryan. This isn’t newsworthy. Michael Bennett is a multiple Pro Bowl player. But after the sack, Michael Bennett took a moment to bow his head and raise a black-gloved fist. It was an open and conscious tribute to Tommie Smith and John Carlos, the 1968 Olympians who raised their own fists on the medal stand as a statement of resistance to racism and oppression. For casual football fans, this may have come as a surprise. For the 900 people who crowded the Town Hall Seattle earlier this month, where I interviewed Bennett, this was an on-field expression of the principles Michael Bennett has carried throughout his life. Below is an edited transcript of our interview. The entire, unedited interview is available at the bottom of the page. Dave Zirin: What do you say to the oft-heard statement that athletes should just shut up and play? Michael Bennett: Most of the time, people want to consider athletes as just being a part of their sport, but they forget that we are a part of this society and we can’t take ourselves out of it, simply because we make money or have a lot of fans. At the core of everything, we’re still just human beings. But when people want us to just be part of their brands and sell things, it makes you go crazy, because when it’s time to speak out, they won’t let you do it, but when it’s time to sell something, it’s fine. If I see something and I’m a part of it, if it’s an issue and I want to talk about it, then I feel like I’m obligated to speak on it. This has been the most politicized NFL season ever. It all started with a knee, too. It all started with a knee. What was your reaction when you first heard that Colin Kaepernick was taking a knee during the national anthem and then talking to reporters about structural racism in the United States? I actually know Kaepernick pretty good, so I wasn’t surprised. I was more surprised that Kaepernick got everyone talking. Whether they agreed with it or not, it was a conversation. Everybody has their idea of what America should be like, but few people are willing to actually go out there and stand on that line. He stood on that line, so you got to give him respect. No matter what happened, people wanting to kill him or burn his jerseys, he stayed true to his path. Forever, I’m going to have a lot of respect for him. The Seahawks decided to stand as a team and link arms. Why? In the Seahawks locker room we literally talked for hours as a team. It’s hard to get people to agree on something, but at the end of the day, we all agreed on one thing, and I felt like that was a big start for any group of people to actually agree on one thing. We all agreed to lock arms, because we wanted to bring the community together. In our locker room a lot of white players wanted to step up, like [Kicker, Steve] Hauschka. He was one of the main people who wanted to do something. But it took hours, and I mean hours. People had tears, and it made me realize that at the end of the day, no matter what we do on the field, at the core of it all, we all feel the pain that everybody else is feeling. To me, taking that stand as a team was better than the Super Bowl. The Super Bowl is great, but when you can get a bunch of people, especially a bunch of men, to be emotional about something… you sit next to this person for four, five years then finally you talk and joke and they open up and it changes your mindset, because it’s like, “Wow, I never knew you felt like that. Dang, we really are brothers!” It’s just one of those things, one of those moments that I’m going to remember for the rest of my life. Does that story also puncture the idea of the football man-code? This idea that football players can’t be emotional, or shed tears? I think so. You’re in a macho locker room and nobody wants to be emotional. The hardest thing for a human being to do, it’s to be vulnerable. I see a guy that’s knocking guys out on the field, and to see him shed a tear on just a thought of something that’s going on, it really changes your mindset about that person. The Seahawks were criticized for your team-wide response instead of just having the most politically aware players taking a knee. What do you think of that criticism now? The easiest way to disable a whole bunch of people is to discredit and turn them against each other. For the Seahawks, [politics] is something that we live and breathe. We’re one of the most organized group of people in the NFL. We wanted to ask, “What’s the next step?” If we’re going to talk it, we’ve got to live it. We met with the district attorney, the governor, mayors, police commissioners. We’re trying to make change. For me, I feel like if I die and the only thing that people talk about is the Pro Bowls and the Super Bowl championship, I feel that people are discrediting me as a person, because I want my legacy to be what I did in the community. Records are going to be broken, but the legacy you leave, it can’t be broken. The Seattle locker room seems like a uniquely open place, especially by NFL standards. Is it the coach, the players, or the city of Seattle? I think it’s a little bit of all three. When you have a coach like Pete Carroll, who’s been in some of the craziest neighborhoods, going into South Central, LA [as a coach at the University of Southern California], getting players to come play for him, going all across America and walking into a lot of African-American homes and telling their parents that “I’m going to take care of your son,” he’s built up a trust there. He’s an open-minded person. Him being able to be open-minded has let people be their true selves. He has opened up the door for guys to speak upon issues that are going on. We have a locker room that’s full of characters. Now that they have a platform to actually speak their mind, and it’s letting them grow into men. You have three daughters. But if you had a son, and he said, “Daddy, I want to play tackle football,” what would you say? I probably wouldn’t let my son play football at this point, simply because how I grew up is different from how my kids are growing up, so I don’t feel like they have to play football. It’s crazy, you think about the word “concussion,” it’s a word that softens what the injury really is. It’s a traumatic brain injury. The normal American has a concussion, they’re done for two to three weeks. In the NFL, you’re pushed to play on Sunday. But a lot of people don’t see that part of the league. They see the player catch the ball, but they don’t see the injuries, they don’t see him as being a human being. People love the players, but they don’t love the injuries. They don’t love that a player has CTE. They don’t love that Steve Gleason is in a wheelchair or a guy breaks his neck. They don’t love that. They love the touchdown, but they don’t love what comes with it, because at the end of the day, everybody believes that we are making a deal with the devil, playing this game. The deal with the devil, sometimes it’s great, but when it comes calling, it’s one of those things where people don’t have sympathy for you. You mentioned your daughters before and I know one of the issues you’re involved in is an organization called Girls First. Can you speak about that? It’s an organization that’s in Seattle and they’re pushing STEM programs for girls of color. For me, now that I have daughters, I see, now, what the Women’s Rights Movement was about because now I have daughters and I’m like, “This is true! This is so real!” I will have a conversation with somebody and I’ll tell somebody I have daughters, and you know the first thing they tell me? “Oh, you better get a shotgun, that’s going to be hard.” Why can’t somebody say, you’re having daughters, man they’re going to be blessed? They’re going to be something great. So it’s one of those things where I wanted to be a part of an organization to be able to push girls and let them and support something that they can have an opportunity to do more than what they’re allowed to do.